Sadhana is a great way to get the day going on the right foot, and this album has the right music with the right artist, Gyani Ji. 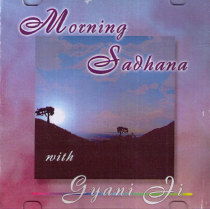 Gyani Ji is a master of Kirtan (spiritual music) from the ancient tradition in India. This album can be sung with for a offical Sadhana experience or used for massage, reiki healing and centering.